Top: Members of ESS outside the Amberations barn, where they had been working on a project. 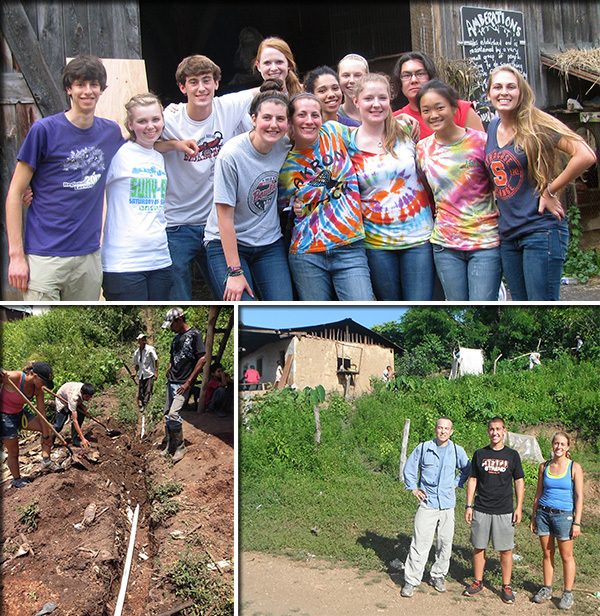 Bottom: ESF student Taylor Brown, left, works on an engineering project with community residents in Honduras; Dr. Ted Endreny and ESS members Thomas Decker and Taylor Brown in Honduras, summer, 2014. ESF students have an opportunity to combine their education, interest in service work and budding professional skills to improve communities, both locally and globally, through projects described as "humanitarian engineering." About 50 students in the college's Engineering for a Sustainable Society (ESS) club have been involved for the last several years in community projects in the Syracuse area and in Central and South America. "Humanitarian engineering implies students are using professional skills to provide critical services for communities in need," said Dr. Ted Endreny, club advisor and chair of ESF's Department of Environmental Resources Engineering. Endreny said the club formed in response to community need, student desire and professional obligation. The effort began more than10 years ago when a club called Engineering Without Borders (EWB) was created at ESF and included Syracuse University students; since then, ESF students launched a new organization, now formally recognized as ESS. Their projects have taken them to Honduras and Peru and, more recently, to communities closer to home where they make a difference. In 2007, the EWB club began working to provide three communities in Buena Vista, Honduras, home to about 300 people, with potable water. Students helped design, construct and install a gravity-fed water distribution system that lets community members draw clean water from their taps. Although the project is ongoing, most of the homes in the community now have uninterrupted access to the water filtration system. Just this past summer, Endreny, ESS President Thomas Decker and senior Taylor Brown, ESS public relations officer, visited Honduras to hand over to community members the responsibility for maintaining the project. The purpose of the trip in August was to sign a "memorandum of understanding" (MOU), said Brown. The MOU involves ESF students, community members and the nongovernmental organization, Alfalite, which oversaw construction, Endreny said. ESS has another ongoing international project in Peru, where the mission is to provide sustainable energy, through solar panels and hydroelectricity, to a community of about 150 people. Development in the community had been hampered by a lack of energy, Decker said. The project was funded by $2,500 raised through ESS and Rotary International. Ecoan, also known as Asociación Ecosistemas Andinos, is the non-governmental organization that worked with ESS throughout the project. Closer to home, ESS students worked with an organization called Amberations in the community of Marietta, about 30 minutes southwest of the ESF campus. Amberations is a not-for-profit organization that supports mental health through natural environment interaction. Research on the project began in 2012 and this past summer, the club finished work on installing a composting toilet near Amberations' trail system. Kristine Ellsworth, a senior who is ESS vice president, was the project lead. The toilet is designed for low-frequency use, and the waste will be composted and used as fertilizer. Gloria Wiley, co-founder of Amberations, has offered to provide full maintenance, and she has been making some aesthetic improvements to the site, said Ellsworth. ESS has begun to plan its next local project, which could be a rain garden in Syracuse approximately 10 minutes from campus, in the outer University Neighborhood. Club members will first conduct a site assessment to decide whether or not a rain garden will be suitable for the site. Decker sees the ESS projects as a bottom-up approach because club members work directly with engineers and community members. He is proud that he has been able to use his education to take a lead role in projects that impact people's lives, and he knows the club's efforts are appreciated. "It's almost like you're part of the community," he said. He believes that, over time, students and Ecoan have built a relationship and trust with Honduras. "I think it's awesome that as undergrads, we're given the opportunity to go places and design projects that change lives," said Kiana Morse, ESS secretary. "Our mission altogether with ESS is that every project we do, we want to be able to implement it and keep it up and keep it going." Said Endreny: "ESF differentiates itself from most other colleges by recruiting students who are driven to put theory into practice. They want to understand how their degree can improve their world."